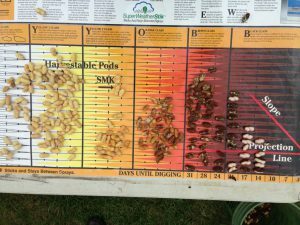 Peanut maturity checks are starting soon! It is that time of year again. Some acres are starting to approach the 120-130 day range. For Ga 06Gs 140-150 tends to be the average for days to maturity. If yours are getting close and you want to have them checked just let me know. a representative spot(s) of the field. Previous: Does 2,4-DB Reduce Sicklepod Seed Production?